Thai people are very patriotic and the Thai national flag can be seen on display just about everywhere in Thailand. It isn’t just government buildings that fly the flag because it can be seen on boats, tuk-tuks, roadside stalls, private businesses and private homes. The flags may sometimes be slightly damaged or faded by exposure to the elements, but they are still a proud symbol. The Thai flag has an interesting history. The first official flag has been credited to King Mongkut in 1855. Prior to this time, it’s thought that various flags were used the most common of which was a plain red flag. To make the flag more distinguishable, King Mongkut (Rama IV) added the royal symbol of the white elephant to the plain red flag. The design of the flag changed again in 1916 under Rama VI. According to legend, Rama VI saw a flag flying upside down and was inspired to design a symmetrical flag to prevent this from happening again. The design he decided upon is the same one used today except that the middle band was initially red and not blue. The middle band was changed to blue in 1917. There is some dispute about the reason for this change. Some historians say it was a response to the fact that Thailand was a World War I ally of Britain, France and America who all had red, white and blue in their flags and the king saw these colours as the colours of freedom. Others say that the blue represented Rama VI who was born on a Friday and according to Thai tradition blue was his colour. It could have been either one (or both) of these reasons that inspired the change. 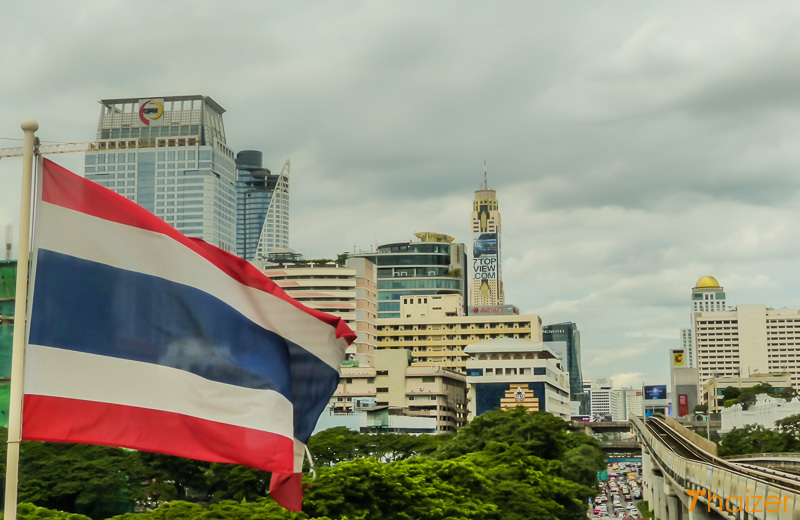 Thailand will celebrate the inaugural Thai National Flag Day on September 28, 2017. The date commemorates the 100 year anniversary of King Rama VI issuing the trai rong (three-coloured) flag as the new national flag. Today, the colours of the Thai flag represent three of the most important things to the Thai people; nation, religion and monarchy. Red is said to represent the nation and the blood that was spilled to keep the country free and independent. White represents religion. Some may argue that white specifically relates to the purity of Buddhism whilst others will say that the white in the flag represents all religions present in Thailand and not just Buddhism. The colour blue in the Thai flag symbolizes the monarchy in Thailand. The Thai flag may be seen on its own or it may be flown with other flags which have their own meaning. For instance, the national flag may be flown alongside a yellow flag with the royal insignia. This is HM King Bhumibol Adulyadej’s flag with yellow representing the king as he was born on a Monday. Similarly, Queen Sirikit has her own flag which is blue (she was born on a Friday) with her own individual royal insignia. Not all yellow flags represent the king. 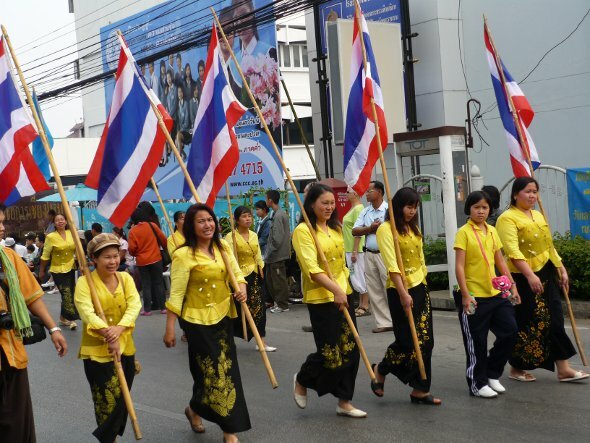 At temples and at festivals it is common to see a Thai flag alongside a yellow flag which has a round symbol on it. This is a Buddhist flag and the circle is the Dharmachakra also known as the Wheel of Life or Wheel of Doctrine.